As we head into final exams, the Irving K. Barber Learning Centre will stay open longer to accommodate students and their study schedules. The Learning Centre will be open 24 hours a day from Sunday, December 2 (opening at 6 a.m.) to Tuesday, December 18 (closing at 1 a.m.). The Irving K. Barber Learning Centre will be open 24 hours a day from Monday, April 9 to Wednesday, April 25. 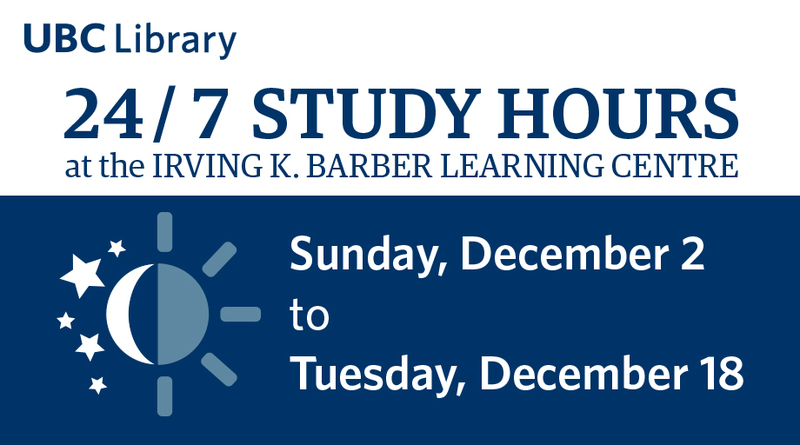 The Irving K. Barber Learning Centre's 24/7 hours begin Sunday, December 3 (opening at 6 a.m.) and end Tuesday, December 19 (closing at 1 a.m.). UBC Library's Irving K. Barber Learning Centre will be open 24 hours a day April 10 to 26, 2016.